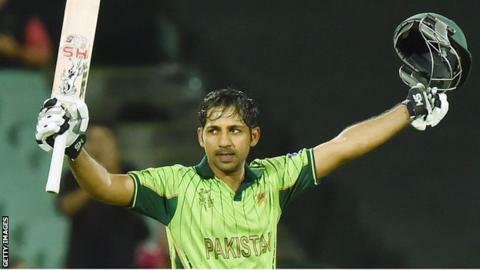 Set 238 to win, Pakistan reached their target with 23 balls to spare thanks to Sarfraz Ahmed's unbeaten 101 in Adelaide. Before the tournament, Cricket Ireland chief executive Warren Deutrom said it would be a "failure" if Porterfield's side did not reach the quarter-finals. This latest win continues the improvement of Misbah-ul-Haq's men, echoing the Pakistan side that began poorly when the tournament was last held in Australia and New Zealand in 1992, only to go and lift the trophy. Victory over Pakistan at the Adelaide Oval would have seen them progress past the first round of the World Cup for the second time, but they were unable to take enough runs from a disciplined attack, then lacked the penetration and accuracy to make the chase uncomfortable. Plenty of the Ireland top order got starts, but there was not enough support for Porterfield, who pulled, clipped and drove his way to the highest score made by an associate captain in a World Cup match. However, the collective accuracy of the Pakistan pace attack was impressive and, when left-hander Porterfield miscued Sohail Khan to mid-on, the lower order was exposed. Despite the sluggish nature of the wicket, the Irish regularly found trouble playing the short ball, with the last six wickets falling for 55 runs. "Ireland are always competitive. You rarely watch an Ireland team play a top team and it is over at halfway. Of all the associate nations over the last two World Cups, Ireland are the ones who stand out." Ireland's collection of medium-pacers and spinners may have been able to use the conditions to their advantage, but regular width aided the Pakistan cause. Sarfraz, dropped by wicketkeeper Gary Wilson standing up to Kevin O'Brien on 37, shared an opening stand of 120 with Ahmed Shahzad, whose cut shots benefitted from Irish inaccuracy. When he skied Stuart Thompson to mid-on and Haris Sohail was run-out in a mix-up with Sarfraz, Irish hopes were revived. But Misbah arrived to steady in a stand of 82, taking two sixes over the leg side before treading on his stumps off Alex Cusack with 30 still required. That left the patient Sarfraz to complete his maiden one-day international hundred, with Umar Akmal belting Paul Stirling down the ground to bring Ireland's spirited campaign to a close. Listen to highlights from Test Match Special's and 5 live Sport's 2015 World Cup coverage.